MOBA genre conventions are much better executed by Dota 2 and League of Legends. Dragons and Titans just isnt a worthwhile alternative. When Dragons and Titans released last year, the notoriously competitive free-to-play MOBA space was already crowded by heavyweights Dota 2 and League of Legends. 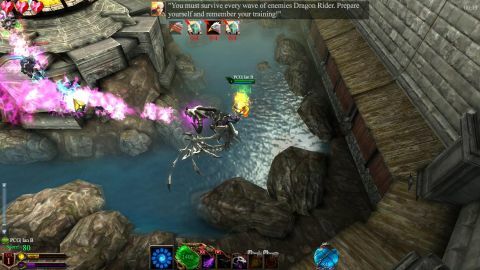 To find its own niche, Dragons was designed in Unity to work entirely in web browsers, and launched on Facebook to become the F2P MOBA you could play anywhere. Not a lot. In form and structure, Dragons and Titans is a carbon copy of the basic Dota model. Two teams of five play on a level divided into three lanes: left, right, and center. It's played from an overhead view with real-time combat, and the front line ebbs and flows like a nervous game of Capture the Flag at summer camp. You level up your dragon by attacking NPC minions for gold, then take your new powers to attack shield shrines and other players. Once the shield shrines are down, you can attack the enemy Titan cage and free your Titan to win. It's a familiar formula. The combat is also very similar to Dota 2's. Holding down the right mouse button will fly your dragon forward, and pressing shift will start flying backward. The left mouse button unleashes your dragon's breath, usually a stream of fire, ice, or poison. A hotbar along the bottom of the screen holds special attacks that are unique to each dragon, cost mana, and come with a cooldown timer. Special attacks with your rider's weapon are also stored on the hotbar, so you'll spend a lot of time with your fingers hovering over these keys. Shooting down minions can be fun, but not more fun than it would be in Dota 2, and without a deep statistical and strategic meta-game, the combat's appeal doesn't go far. It's mechanically sound, but it's not driving anywhere. Its only significant departure from established MOBAs is a cast of badass flying death machines. Dragons and Titans is like a smoothly animated Wikipedia entry for “dragon.” Wyrms? Yup. Chinese foo-dog dragons? It's got 'em. Japanese koi dragons? Yessir. If it has ever flown and breathed death from an oral cavity in all of literature, film, and folklore, there's a version of it here. Some dragons are faster or hardier than others, but nothing extreme. With all things being equal, you're free to pick a look that you like. This customization, of course, is also where Dragons and Titans starts to make its money. Buying a specific dragon will cost between $3 and $6. The rider's weapons have different effects but stay within a balanced ecosystem, so you can pick your favorite for $1 to $2. These weapons enable different effects like a magical blast, a stream of explosives, traps, or even a healing aura. In a game focused on the dragons, I actually found the rider weapons to be the most interesting and varied game mechanic. The most overpriced and least interesting customization, the rider avatar, is a dumb way to flush $5 for a stack of pixels you'll have to zoom in to notice. I'll be the first in line to shout about abuses and outrageous microtransactions, but spending less than $15 for an instant custom setup isn't an egregious use of the model. And of course, if you've got the patience, you can use in-game reward points to unlock new dragons and weapons without ever spending a cent. The problem is that, after you've kitted yourself out—or just made do with the generous, always-rotating free offerings—there's barely any game to be played. The single player options crumble against basic combat mechanics and stupid AI. These missions are tedious. In one climactic battle, I defeated all of the enemy minions by flying backward in a wide, lazy circle, spamming my fireball until they died. The heart of the game is its multiplayer, but even there options are sparse. The MOBA mode only has one map. There are two other modes, theoretically, but I never found enough players to get a match going. And here is the primary argument against bothering with this game: when I last played there were 350 players logged in to Dragons and Titans through Facebook and over 600,000 players slugging it out in Dota 2. After a day on Steam, the population hasn't increased significantly—maybe it will grow from here, but it seems unlikely. An in-browser MOBA offers flexibility, but that's lost with a dedicated install and a Steam account. Anyone interested in this kind of game will already be having fun in Dota 2 with half a million of their closest friends. Cool dragon art doesn't contribute enough to the genre to make Dragons and Titans worth your time.